The 2017 Honda Accord is available now at Brilliance Honda of Crystal Lake, and the Sport trim level of the sedan adds more power and more aggressive styling details to the base Accord. If you’re looking for an Accord model that adds both performance and unique details, but is still affordable, then the Accord Sport could be perfect for you. Find out more here at Brilliance Honda of Crystal Lake, just a short drive from Elgin, IL. The Accord Sport is powered by the 2.4L four-cylinder engine used in other Accord models, but since it uses a less restrictive dual exhaust, it makes more power at 189 hp and 182 lb-ft of torque. That’s an additional 4 hp and 1 lb-ft over the base Accord. The Sport trim earns an impressive 26 mpg city/34 mpg highway/29 mpg combined when equipped with the continuously variable transmission, and 23 mpg city/32 mpg highway/26 mpg combined with six-speed manual based on EPA estimates*. The Accord Sport comes standard with safety and security features such as a multi-angle rearview camera, multiple airbags, and traction and stability control. Upgrade options include the Honda Sensing system, which adds adaptive cruise control, a lane departure warning and prevention system, road departure prevention, a forward collision warning system, and automatic forward collision prevention braking. Find the latest 2017 Honda Accord here at Brilliance Honda of Crystal Lake today. We are your local Chicagoland area Honda dealer, and we can let you test drive the Accord so you can find the right model for your needs. 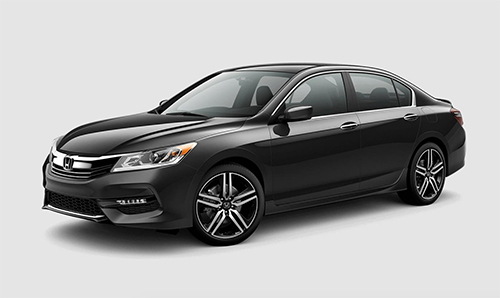 Visit us at 680 W. Terra Cotta Ave. in Crystal Lake, or contact Brilliance Honda of Crystal Lake online if you have any questions about the Accord Sport!